Wow, the blogosphere has been absolutely gushing these past few days over the news that an Earth-like planet may have been discovered in the ‘hood. 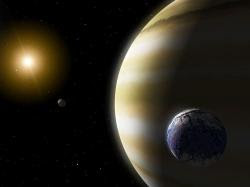 This planet may boast a moderate climate that could conceivably support life and is only 20 light years away. Michael Anissimov points out that we have a human hospitable planet right here that we’ve barely even begun to use. He also argues that “even if we did need to leave the Earth, there is a tremendous amount of raw materials for space colonies right next door in the form of carbonaceous asteroids, which make up about 75% of known asteroids.” Moreover, warns Anissimov, “we should think carefully before sending off colonists to far-away places without ensuring that they’re capable of protecting the fundamental freedoms of their citizens.” Specifically, he worries that a blight may come back to haunt us (which also reminds me of the Honored Matres of the Dune series). Indeed, Cowen is on the right track. A primary argument used to reconcile the Fermi Paradox is the Rare Earth Hypothesis. This line of reasoning suggests that we haven’t been visited by ETI’s because life is far too rare in the cosmos. But if we have discovered an Earth-like planet as little as 20 light years away, it’s not unreasonable to suggest that our Galaxy must be absolutely teeming with life. This would seem to be a heavy blow to the REH. So why is this bad news? It’s bad news because our biophilic universe should be saturated with advanced intelligence by now…but it’s not. The Fermi Paradox is very much in effect as a profound and disturbing unsolved mystery in astrosociobiology, philosophy and futurism. Previous entry: Is the world ready for cyborg athletes?